A friend of my sister and I from high school came on our September paper crafting retreat too. She's not a cardmaker. She has a couple of Scrapbooks on the go, but one has been in the making a long time (just like all of my albums too!). So, she took the opportunity to work on that album. Our Stampin' Up! Cardmaking class were the first cards she's made. She was pleased to get her toes wet since, her aunt (or great aunt) has always made Holiday cards to send but is getting to the age where it has become difficult to keep up. So, Anita thought our trip would be a good opportunity to try her hand at it with the possibility of taking over the reigns. Here are some cards from Anita. The first three from the left are from the class and the two on the right are by Anita herself. She has some stencil templates and she is very adept at using them. The Gingerbread man is one. Me, I forget half the tools I have but Anita is good at consistently putting what she has to good use! The stocking in this set is also from her stencils. I like how she strung the word "joy" with a golden line on that one, and also the finishing touch of decorating the sock's brim. Anita made great progress in her scrapbook: 9 pages, I think it was. I was hurriedly snapping photos while everyone was packing up, so I did not snap them all. I ask her to lay out her favourite of the bunch for me and I would go and grab a shot before it was put away. This layout is for a wedding of a family friend that she attended in British Columbia. The book includes pictures from the wedding but also the tours in BC's gardens and sites. The little page flowers were a new technique for Anita. We stopped at Michael's on the way in and there were these flowers in bottles in the clearance section. I recognized them because my co-worker Debbie had bought some and let us try them. (You can see the tags I used them on in an earlier post.) However, Anita could not decide what colour to get. The bottles had 3 shades of the same colour in them. I suggested finding all white. That way, she could colour them to whatever colour her project needed. Unfortunately, there were none like that in the clearance section. So, back to the full price sections we meandered and found some. Boy, were they ridiculously expensive! Triple the price of the clearance stuff and 1/4 the number of flowers! We were glad Anita was able to attend the retreat. It's been a long time since my sister and I have seen her and even longer since we have crafted together! My sister-in-law, Terri-Lynn, also made Christmas cards during our crafting retreat. She made a couple that were not Christmas too. I think she was quite happy to break in to supplies that were sitting idle for so long. I think she surprised herself with how many she got done. Once you get "in the zone", it's quite relaxing to sit and create and let the mojo flow moment to moment without stressing over it. The first two (from the left) in this picture were part of the Stampin' Up! class we took. Next to that, there is one that is wrapped like a gift. The flowers on it have a touch of glitter to dress it up just the right amount. The butterfly one, my sister water coloured the background butterfly. That is my first Memory Box die set: Darla butterfly (solid) and Vivienne butterfly (outline). When I saw the Vivienne butterfly, I had to have it. It is spelled the same way as my mother's name and I have never seen anyone else spell it that way. It was a sign, for sure! Vivienne, beloved mother (1948-2000). I like the two in the middle most in this bunch. It's typical of my style, so of course I would like it! There is large focal image and small border sentiment and then a small amount of additional embellishment. Terri-Lynn was thinking right on the money by cutting out images from the Holiday papers to add as focal parts. She is *this close* to fussy cutting! (Where one cuts around the actual individual shapes instead of in straight-line blocks.) One day. I'll get my creative crew on it one day. Norma seems to take a while to talk herself into making cards but, once she gets in to it, she does quite well. She has a great eye for pairing colours and for creating a grounding focal on her designs. At our craft retreat, she came away with the second most number of completed Christmas cards at 13 (NOT counting the three we made in our class). I think she had a very relaxing time, being able to craft without having to hurry, without deadlines, without chores waiting to be done. Aaaaah, vacation is sweet! She used some large die cuts from a set she picked up (perhaps at Michaels? Or else at Scrappin' Great Deals where we stopped outside of London, Ontario.) Of this bunch, I like the stack of presents the most. It's simple, yet effective. Second to that, I like the one with the green button stars. It's as close to a cluster embellishment that have been popular in scrapbooking of late. Half the ladies at our retreat did not craft on the first night. By the time supper was finished, it was somewhat late. Claire was one. On day 2, she began creating her bits for her cards, but still had nothing finished for us to ooo and aaah over before we stopped working on our projects to take the class and then have dinner. By the end of the night, though, there was an EXPLOSION of cards! She had transformed those bits into 35 finished cards! Her cards were of two styles: an embossed card and a joy fold card. The embossed card uses a Stampin' Up! flower folder and a Stampin' Up! Christmas sentiment. The poinsettia is a dimensional embellishment. On the bear card, Claire used Twinkling H2Os on its little nose. Our Stampin' Up! demonstrator even remarked she wanted to hire Claire to make her Christmas cards! Good job Claire. I'm jealous of your productivity! I hope those who receive your handmade cards appreciate the time and dedication that went in to them. So, I went to my first ever crafty getaway over the weekend. I had almost gotten my new studio arranged, but then I had to tear through it the night before leaving to packup all my stuff. I'm actually impressed that I was able to condense a room full of stuff down to a rolling tote and the largest suitcase in the house. 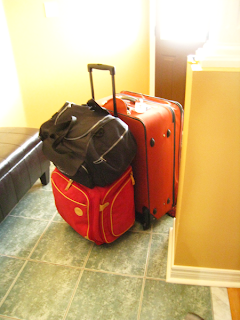 Of the things to bring, my clothing and personal belongings made up only 1/3rd of my baggage! It fit in a small carryon bag (duffle bag style) and there was still space inside it. There was ZERO space in my crafty baggage and I was concerned about our shopping trip. Where was I going to put the new stuff? Tee hee! We had two small SUV's (a Subaru Forester and a Ford Escape) packed to the BRIM. 6 ladies. One vehicle had 2 people and the back seats down. We were considering strapping things to the roof! When we arrived, we were surprised how LARGE the house is. It is very old and very dated, but everything served its purposes. If it ain't broke, don't fix it. Two of the ladies were already renovating in their minds to live there! The front porch of the house is a wall of windows (with a door breaking it up in the middle, but almost a wall of windows) looking out on the blue St. Clair river. It was gorgeous. The best part was, we were the first guests to enjoy the new living room furniture. It was rather lovely. The first setup we tried was 2 people per table and 2 tables in full view of the river. Then my cousin's wife, Jodi, came to teach us a Stampin' Up! Christmas Card Class. We rearranged the tables and set up new ones for the class. I liked this set up better, because everyone could see the water (two only glimpse, but better than before). I think next time, we'll put the communal tools in the centre tables and make 2 L-shapes in the wings for the best river views. Else, we will push them all together like this again to make for better conversation. I will show you the goodies we made through the next few posts. Claire made the most: 35 Christmas cards! I hope this retreat has kick-started her mojo to keep going through the season. Terri-Lynn and Norma made Christmas cards also. Anita made some scrapbook pages and her FIRST cards ever! My sister, Lara, dabbled with her watercolouring of stamped images and made a few into Christmas cards and completed a page in one son's baby book. I completed more scrapbook pages in my wedding album in the weekend than I have in the last two years plus a couple of my youngest nephew's baby book. I left off the titles. I needed my electronic cutter, so I do need to do the finishing touches still. Overall, it was a fantastic weekend. We ate well, we relaxed, we enjoyed, the weather was nice. The driving was loooong though. I think, next time, we will increase the stay one more day so the driving is a little farther apart. 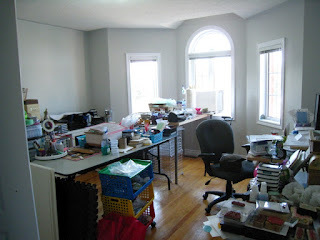 Some time back, my wonderful husband offered me our larger shared computer room to use as my scrap room and he would move his computer to my old room. We had planned to make the switch on the Canada Day long weekend since that was the day I got my original scraproom in our old house. Unfortunately, I ended up working overtime that whole weekend, so we rescheduled it to this one. Here is the beginning. We emptied the room as much as possible (meaning we put the bed in the guest room up on its side and filled the room with stuff plus have things derelect in the hallways too!) and pushed the rest of the stuff in this room in to the middle. The old colour was a strong blue. This room was occupied by a teenaged boy when the previous owner lived here. My husband painted it a nice grey for me (it's CIL Universal Grey). It's the colour of newspaper, but it has a blue undertone (it's a cool grey, instead of a warm grey.) I choose the lightest grey on the same paint chip as the baseboard and frame colour. It's an almost-white grey. I couldn't believe the difference in the window frames and the doors when we painted them. 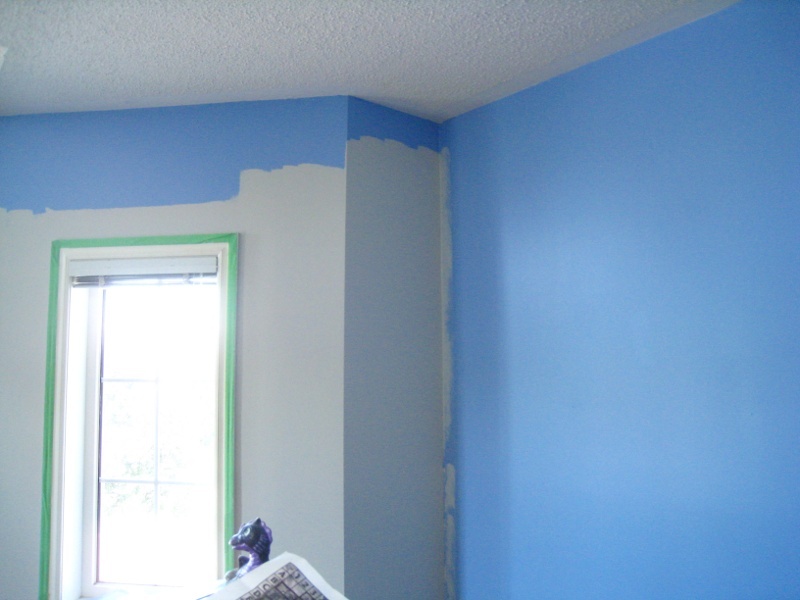 The old colour looked yellow and stained next to this colour. The previous paint job must have been REALLY old. Here is the room with all my stuff splayed out. Wow, what a mess! (But a lovely mess!) I don't know why, when I pictured my new room, I kept thinking that all we had to do was put the furniture where it belongs and everything would just be where it's supposed to be. No, moving doesn't happen like that. I have A LOT of cleaning and arranging to do! 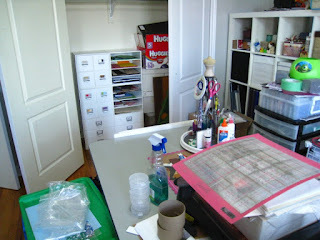 My GrandeMark is in the corner and I plan to sit at the counter height table, so my paper cutter will be there. The supply I'm struggling with the most is the stamping station. Right now, stuff is piled on the microwave cart by the door, but that's where my computer's printer will be. Hmmm... I'll figure something out! I'm just happy that my two-table long island in the middle will comfortably seat six and I can seat one at the end for 7 if I need to. Now my workshops can be upstairs where all my supplies and tools are to save me from running up and down the stairs six times per class!